I’m going to be honest with you. There’s some straight-up blunt talk in this article. But it’s only because I care about you and I want what’s best for you. Let’s stop playing games with our church family and take it very serious this year. Who cares what’s happening in culture around us?! Let’s be the exception. Let’s stand out. Let’s be different. And by being different, be able to make a difference. By the way, I should also let you know that I define regularly differently than our current culture. By regularly, I mean once a week, not once a month or once every six weeks. That may be the norm now, but I reject this. I grew up going to church 2-3 times a week and loved it. So, just to be clear: regular = once a week. 1. The New Year is a great time to start New Routines. You’ve probably already spent some time thinking about what you’d like to accomplish in 2016. Maybe you’d like to spend more time with your family, make more money or lose weight. While you’re naturally thinking about changes you want to make in your life, it’s a great time to put church at the top of the priority list. Start your week with church. Start your year with church. Tell people you are committing to being at church every Sunday, and they’ll help encourage you to be there. 2. Going to Church once a month has about the same effect as going to the gym once a month. There are aspects of my life I thought I would make more progress on in 2015. One of them being getting into better shape. I’ve never been a gym rat. I’ve had gym memberships in the past. At best I’d go once or twice a week. Often times more like once a month. This last year, surrounded with opportunities to walk, hike and do other physical activities, I didn’t do nearly as much as I wanted. Consequently, I find myself in pretty much the same place as I started 2015. The same is true for following God. Many of us have probably started this year with a desire to want to walk closely with God all through the year. 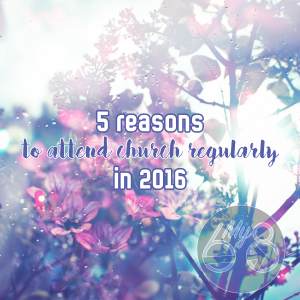 This will be incredibly challenging if we don’t make going to church a top priority. God has designed us to be in community with other believers. God uses this community to encourage us, to shape us and to disciple us. You can’t attend once a month and expect to have any level of communion with God. 3. The Bible Says We should. It’s easy to neglect meeting together. It’s easy stay at home on Sunday morning. It takes effort to get to church, more if you have a family to get ready too. Some even have good excuses, like working graveyard the night before. Before too long, it becomes a habit to stay at home. What feels like a couple of Sundays goes by, and you venture back to church. It feels foreign and different. You’re surprised that people are surprised to see you. “I haven’t been gone that long” you might say. When the reality is, you have only been at church two out of the last 12 Sundays. In the meantime, you are still struggling to walk with God. You’re not making any progress as a disciple. 4. You’ll start to develop relationships with people who are pursuing God. Andy Stanley has said: “Your friends determine the direction and quality of your life.” Do you feel like you’re continually being pulled down by the people around you? Do you get your head and shoulders up above the crowd, only to be pulled back down? Do you make progress for a short time, but then, eventually, end up right where you were before? There’s a good chance that is happening because you’ve surrounded yourself with the wrong people. Forge some new relationships and new community this year. Surround yourself with people who encourage you to become the person God created you to be. Surround yourself with people who will prod you on to doing good deeds and discourage you from doing bad ones. Surround yourself with a community that wants to stir you up for the right reasons – not to watch you make a fool of yourself, but to see you take strides in the right direction. 5. You being at Church is an encouragement to others who are there. We often think of going to church in selfish terms. “What am I going to get out of it? What’s in it for me?” How often do you think about who you might be letting down by not being there? Do you think about those who find encouragement from you, and when you’re not there they don’t find the encouragement they need? There may be someone who needs to hear from your life, but you’re not there to share your life with them. Maybe, the most important thing we need to do this year is to stop viewing our church attendance as something we do for ourselves. Maybe, we need to stop being so selfish with our time and start giving of our time to encourage, stir up and prod others who need us. Just a thought. One more thought on this one: Have you considered how your presence affects visitors who come and check out the church? How does it affect people’s view when you’re not there to greet and welcome guests who are attending for the first time? How many people might be coming to church regularly if you were also there regularly to warmly welcome them, build a relationship with them and encourage them? Since Christianity is a group effort it is impossible to go it alone. Thanks for this reminder!